When Elizabeth Ferrell was a young student, Suzanne Farrell told her something she'll never forget. "She said she was going to paint eyeballs on my eyelids," Ferrell says, laughing, "because I was looking down all the time." Ferrell now uses the same phrase when she teaches at American Ballet Theatre Jacqueline Kennedy Onassis School. "Students have to make sure their eyes are open and alive, so they can communicate with the audience," she says. "It starts in the classroom." Some dancers instinctively know how to engage an audience. For others, stage presence is a learned skill that must be developed over time and practiced in class. From encouraging simple postures to coaching nuanced facial expressions, there are ways you can help students explore how to present themselves professionally—prior to getting onstage. 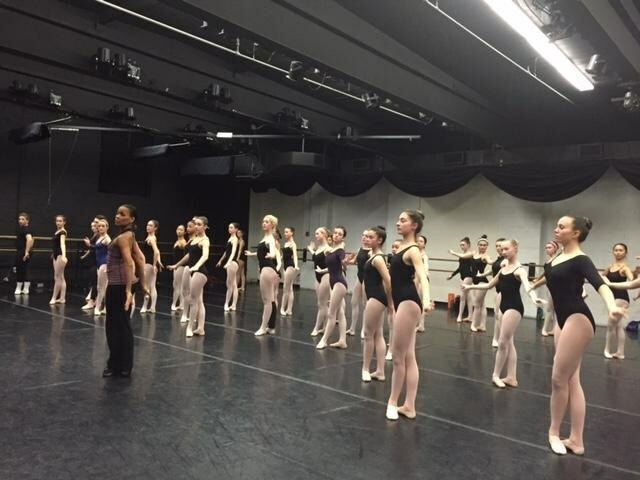 "A lot of dancers rely on the mirror to do the right steps," says Johnson. Practicing without the mirror will develop confidence and prepare students for the stage. Photo courtesy of Johnson. 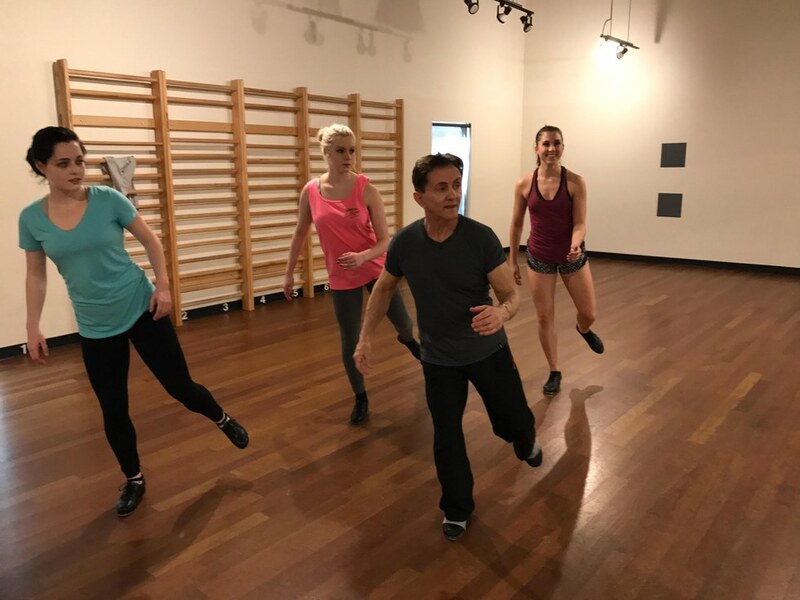 Tony Coppola, of the Rock Center for Dance in Las Vegas, suggests dancers consider themselves performers 24 hours a day. "Your stage presence, or carriage of yourself," he says, "is important not just within the walls of the studio—it's how you present yourself in daily life, even when you're walking into a grocery store." Good posture plays an important role in establishing body carriage. Dancers should think of projecting the energy of their chests up and forward into space, while aiming to have the longest neck possible. Christina Johnson, rehearsal director at Complexions Contemporary Ballet, might ask dancers to show off the diamonds on their imaginary necklaces, using imagery to help inspire the right feeling. Acting classes can also help dancers feel more comfortable with storytelling and dramatic roles. "My musical theater students have a little edge over the ones who are only dancing," says Coppola. "They have a different presence and confidence." Encourage the use of épaulement, showing how each position can translate into a different mood or feeling. "In tendu croisé, it's a proud feeling, with a wide chest and shoulders, head lifted and focus up," says Ferrell. "In écarté, the eyes are lowered or raised, and it's a different feeling—more mysterious." Ferrell might also add a port de bras to greet the pianist or a guest in the room. "The port de bras and épaulement aren't just positions. They're communication tools," she says. "The dancers should invite the person or audience to go with them." "Start performance opportunities small," says Coppola. Students can perform for other students in class or just for the teacher. Then, grow the audience slowly, so that when it's time to be onstage, it's less intimidating. Photo courtesy of Coppola. To help students overcome any shyness or embarrassment over expressing themselves, Ferrell asks them to respond to the music being played for each exercise in class. "They don't have to smile, necessarily, or perform," she says, "but they should feel the different kinds of responses their bodies have to certain music." When they step forward for an adagio, for example, Ferrell suggests they take a soulful approach. In a petit allégro, the dancers should have attack in their legs and show energy in their facial expressions. "It's a different feeling completely," she says. A pianist can help by playing music that students know and love. If you don't have an accompanist, download songs or find CDs that might inspire emotion in your class. "Find a song that the kids really relate to, and then their pliés will become a performance," says Ferrell. Make the classroom a safe place for students to express themselves. Photo by Dylan Giles, courtesy of Johnson. Dancers should use their eyes to connect with other dancers and the audience. "If they want us to focus on their pointe work, or if it's a romantic feeling in an adagio, then a downcast gaze is OK," says Ferrell. "Otherwise, we want to see their eyes." 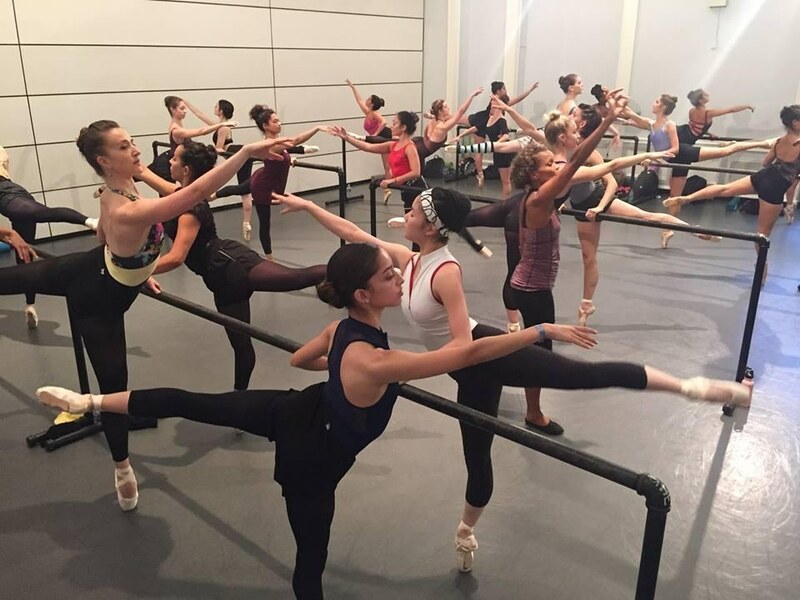 Standing at barre, dancers should look beyond the person standing in front of them. When in arabesque, the focus must go past the fingertips. "It's the same in center," she says. "They should look beyond the mirror, so they don't get that vacant look that kids can sometimes get." Occasionally, dancers may overdo their facial expressions. "I remind students that the performance is not for their dentist," says Coppola. "They can't have a forced smile." If dancers continue to exaggerate or appear insincere, Coppola will have them repeat the dance with no expression at all. Then, with each run-through, he will allow them to slowly add a little more. "Exaggeration is such a bad habit," he says. "It could affect their careers down the road." Facial expressions should instead be a genuine response to a feeling that's happening inside. "Dancers have to be honest, real and in the moment," says Johnson, thinking of advice that Alvin Ailey used to give his dancers. "Then they can use real-life experiences to inform their movements." She likes to incorporate this idea early in class, even at barre, encouraging dancers to be aware internally and externally through each exercise. "Class is a practice in performing," says Johnson. 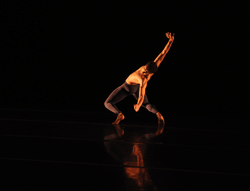 "Dancers should approach every combination as choreography that could be done onstage." Julie Diana was a principal dancer with San Francisco Ballet and Pennsylvania Ballet. She and her husband Zachary Hench now direct Juneau Dance Theatre in Alaska.